Nagoya, Japan, September 4, 2015 – There is just one day left in the #VabochanChallenge. Use the hashtag and tell us which player you think will win the highest number of most impressive player awards for your chance to win a miniature version of the mascot. 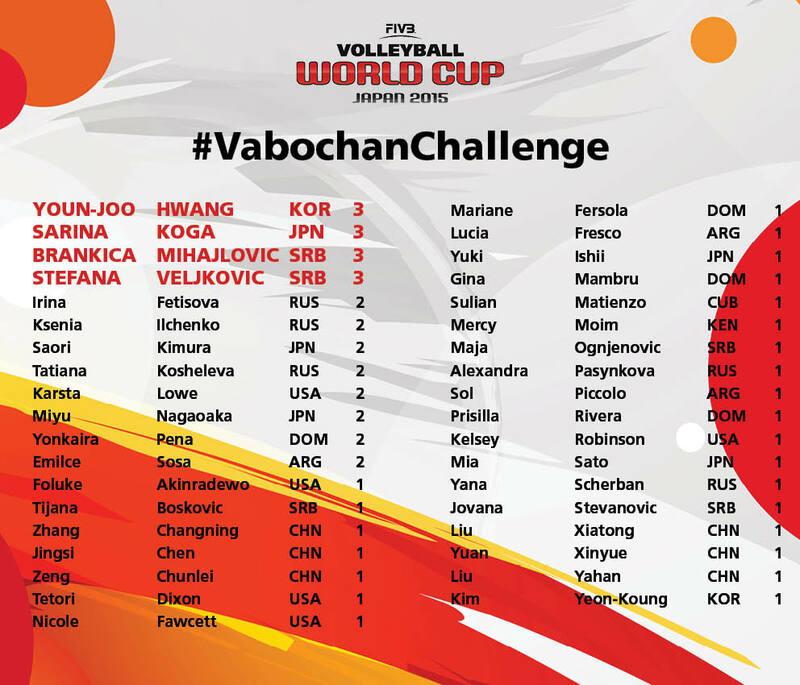 Using the hashtag #VabochanChallenge and #FIVBWWCup we want fans to tell us which player they think will win the most Vabochans over the course of the tournament. One will then be picked at random to win a cuddly version of the mascot signed by the player with the most Vabochans. It is a four way tie at the top now, with Serbia’s Stefana Veljkovic joining compatriot Brankica Mihajlovic, Korea's Youn-Joo Hwang and Japan's Sarina Koga on three Vabochans. Send us your thoughts before 16:00 GMT on September 5 for your chance to win. By entering, fans agree to take part in the #VabochanChallenge contest. Our winner will be picked at random. The winner will receive a toy Vabochan signed by the player named Most Impressive in the most matches. The contest winner will be announced no later than September 8 2015. To receive the award, all winners must be contactable via Twitter.